HBO had the TV film in production within 24 hours of the death of Osama Bin Laden. It will be shown on May 25th and we wait for it with baited breath. 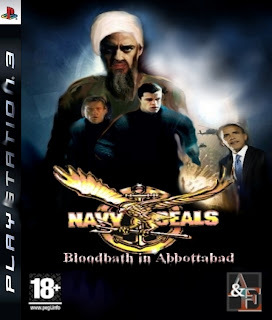 Now, many people are going to want to shoot Osama Bin Laden in the head themselves, albeit in a virtual environment, so you cannot blame A&E for rushing this game into production. You do get to deal the fatal blow to the terrorist leader, so this game delivers in that respect. Not in many others though. There he is! Kill him! 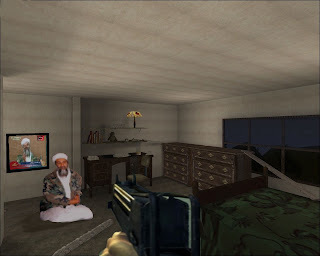 KILL HIM!!! Graphically, the game is generic. Shooting bad guys in poorly rendered corridors is the order of the day. Sound is, on the whole, woeful, but does boast some character voicing by the actors in the forthcoming film. Colin Firth as Obama, in the US Command cutscenes, is so bad he's good. Storyline, well you know what happened. You might like this, we were not impressed.